A single cup of strawberries provides more than 90 milligrams of vitamin C, the recommended daily requirement, which promotes eye health. As delicious as they are vibrant, strawberries are perfect for adding a splash of red color to liven up a dish. 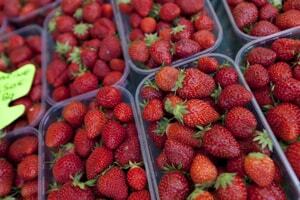 Strawberries also contain healthy doses of fiber and manganese.